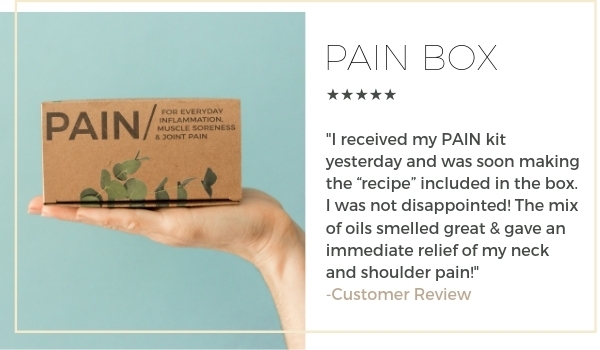 Our Pain Gift Box includes 4 effective single essential oils most commonly used to relieve muscle pain, 1 bottle of our proprietary SOOTHE muscle blend oil, and 1 bottle of our carrier oil Emu. The attractive and compact gift box includes all the information on how to use the oils to relieve pain. Turmeric has been known for thousands of years for its amazing health-promoting properties. There are various ways one can use turmeric, using turmeric essential oil (obtained from turmeric root) is one of them. Extraction pulls out all oil-friendly compounds from turmeric root. Turmeric essential oil then can be used in various ways to provide benefits against inflammation, muscle pains, etc. Turmeric oil is very powerful and packed with rare compounds as it is extracted from such a powerful healer herb. When analyzed turmeric oil may show the presence of 400-500 different kinds of molecules. What is even more amazing is that many of these molecules have receptor sites in our neuroendocrine systems too. Industrial usage: Turmeric oil is used as a spice in food industry. It is also used in pharma industry where it is used in making anti-inflammatory, pain relieving, anti-microbial, anti-fungal, antiseptic (and more) drugs/ointments. Benefits to the liver: Ar-turmerone, a compound present in turmeric oil is known to support liver and keep it healthy. Frankincense has been used since antiquity with references of the treasured resin bestowed to Jesus by the three wise men. It is grown primarily in the Middle East, Northern Africa, and India. We offer the Indian variety, Boswellia Serrata. It has a thinner consistency and spicier scent than it’s sister varieties (carteri, frereana, etc). It is considered an extremely therapeutic oil. Emu oil is taken from the fat of this bird during processing. Emu oil can be taken by mouth for improving cholesterol levels, as a source of polyunsaturated and monounsaturated fatty acids, for weight loss, and as a cough syrup for colds, H1N1 (swine) flu, and flu. It can also be applied topically for skin and muscle conditions. This is a fun little do it yourself kit to make up your own pain relief oil. You can adjust the scent by adjusting the measurements to customize this blend to your liking. I initially bought this kit for my husband who recently had a horrible accident that caused multiple fractures. I followed the recipe included in the kit then used it on him. It seems to help. I also use it on my knees, lower back, and my foot that was broken a couple years ago and it helps take away the aches. My husband also has used the Emu Oil for his psoriasis and it helps with that. I received my PAIN kit yesterday and was soon making the “recipe” included in the box. I was not disappointed! The mix of oils (Frankincense, Tumeric, Lavender & Wintergreen) smelled great and gave an immediate relief of my neck and shoulder pain! This kit works better than I expected. As soon as it arrived I prepared my rollerball using recipe card included. My pain level was decreased from 9 to 6 after 10 min and after second application 3p min later it was gone and I was able to sleep comfortably all night without having to use prescribed narcotic analgesic. Love it and will continue to order it.